My first entry to the popular and much-loved food blogging event, Is My Blog Burning…hooray! This month’s IMBB is hosted by Linda of At Our Table and is entitled “Summer’s Flying, Let’s Get Frying”. When I heard that frying was the theme for this month’s Is My Blog Burning, I thought “Perfect!” because it just so happens that I have been dying to try out a recipe that dealt with just that. This particular snack is something for which I have had an unrequited craving for over a year, but due to said food item being on another continent, I had no way of satifying this craving unless I finally pulled my sleeves up and made it myself. What better way for me to attempt my maiden IMBB entry than with something I love to bits…Oliebollen! First, a little background on my love for Oliebollen: A year or so ago, I was based in The Netherlands for around 3 months, for a job I was doing. I enjoyed my stay immensely and during that time discovered quite a few foodie items that I fell in love with — raw herring with onions, Dutch pancakes with stroop, and Oliebollen. When Christmas time drew near, a wonderful stall with GEBAK (pastries) spelled out in lights appeared in the Dam Square (along with a giant Christmas tree and and ice skating rink…wahoo! ), very near where I lived. The stall was filled with yummy delights and this is where I met, and was subsequently enamored by, Oliebollen. Oliebollen are Dutch fritters, usually filled with apples and raisins, kind of like a beignet. The stall sold different varieties but my favorite were the plain ones, just dusted with powdered sugar. When that stall set up shop, I must have eaten one (or more!) every single day. This was basically a deep fried ball of dough, but calories or cholesterol be damned, I was in love and no one was going to stop me! 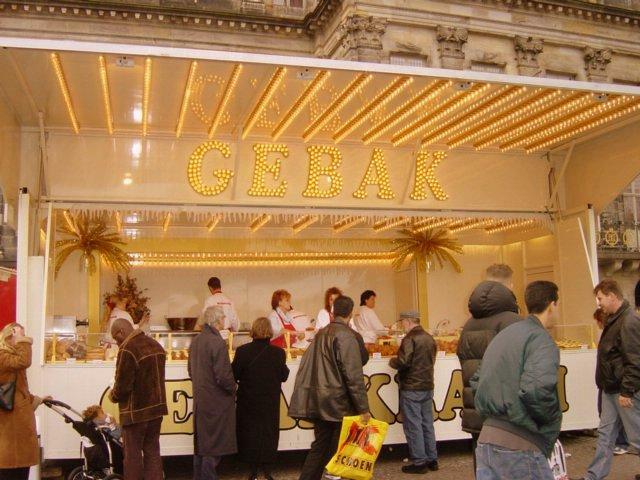 Then one day, after the holidays, the stall and the oliebollen disappeared. I had no idea where they went. I searched high and low but never found them again. I learned later on that oliebollen is traditionally made during the holidays…but as I left The Ntherlands before the next holiday-time rolled around, I never had them again.Fast forward to the present time. I am back home in my little piece of the tropics and start my fledgling food blog. A post I write which mentions stroop earns a comment from a lovely Dutch girl. When I mention other Dutch treats I sorely miss (oliebollen obviously being one of them) she generously shares her recipe. 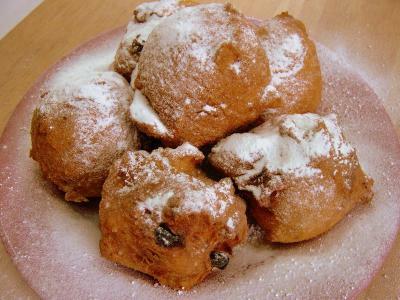 Have the fates conspired to reunite me with my beloved oliebollen?You can find the recipe here. As I wanted to recreate my “plain” oliebollen, I made the following changes:- I didn’t add the cinnamon to the dry ingredients at first. – After my batter/dough was ready, before letting it rise, I halved it in two. One part I kept plain, and to the other I added: ½ teaspoon cinnamon, 50 grams raisin, and half of the apple chunks. – I omitted the currants as you can’t really find them here. This way, half my batch was plain and the other half had the traditional raisins and apple. I cannot even begin to describe my anticipation as I watched the soft balls of batter turn a lovely golden brown in the hot oil.Finally they were done! I sprinkled powdered sugar generously on them and leaned in for a big bite, barely waiting for them to cool off a bit. BLISS! They were just as I remembered…soft, chewy, and tasty, with just the right amount of crisp on the outside. The apples and raisin are the perfect fruit pairings I think for this kind of fritter…but I still love the plain ones best. So there I was, lost in a good-food-funk and delicious memories…you can be sure that I won’t be waiting for any kind of holiday before making this again! « 80 Breakfasts is featured in Pinoyatbp!